Your whole family will love the chance to step back in time and experience the romance and charm of the South with the Charleston City Tour! This incredible tour provides you with round trip transportation from your downtown Charleston area hotel to the historic district known as Holy City. For 90 minutes, you will tour this area while enjoying a full narration packed with fascinating information and stories from past events and legends. Your tour guide will take you to such Holy City hotspots like the College of Charleston, the Battery, the Charleston Museum, the Citadel, and Rainbow Row. You will have the chance to see historic architecture, snap some photos of Fort Sumter, and explore The Market on this exciting tour. 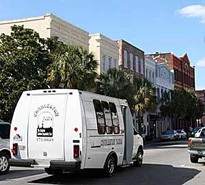 Charleston City Tour is the perfect way to experience the history of beautiful Charleston in an efficient manner. Space is limited on this popular tour, so be sure to reserve your space on the Charleston City Tour today! In addition to the Charleston City Tour, you can visit the three story Joseph Manigault House, an amazing piece of Federal-style architecture full of valuable tapestries and famous for its designers, brothers Joseph and Gabriel Manigault. Tour lasts approximately 2 hours. Visit highlights of the Charleston City Tour and tour the sharp, pillared Magnolia Plantation, with its original construction in 1791 close to the Mississippi River. Although the house first started out as a cottage, owners used add-ons to make it into a full plantation. Tour lasts approximately 4.5 hours. View many of the gardens and architecture on the Charleston City Tour and add the Middleton Place Tour to your excursion, with views of the Middleton family legacy. View their rural farm area with stable yards, a house tour and their gardens. Tour lasts approximately 4.5 hours. Our guide was very knowledgeable but a bit arrogant and he talked too fast so his words slurred together. Hard to take good pictures out of a bus window.